• 01 Nov 2016: Thematic NGO Report by Ditte Dyreborg / StopIGM.org (see above). 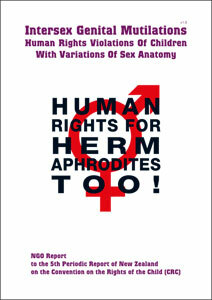 This report only contained information specific to Denmark and complements the thematic NGO report for the UK submitted for the 56th session containing the general information on Intersex, IGM Practices and why they are in breach of the Convention on the Rights of the Child. • 10 Feb 2017: Unfortunately, the Pre-Sessional Working Group compilig the List of Issues (LoI) with questions for Denmark for the session did NOT include intersex or IGM. • 15 August 2017: NGO Report for the Session (see here), complementing above 2016 Thematic NGO Report. • 29 Sep 2017 or soon after: Concluding observations for Denmark, hopefully with another severe reprimand for IGM practices. Review of New Zealand: Thu 15 Sept 3pm CET [Fri 16.9. 01-02h NZ time] + Fri 16 Sept 10am CET [20-23h NZ time] – to be broadcasted live via webtv.un.org (if needed scroll down under "live now" on the right to select)! The Concluding Observations for New Zealand – hopefully with another severe reprimand for IGM practices – are due at the end the 73rd CRC Session (30 Sep 2016).